Ob Ponies, also known as Priob ponies, are from the Khanty-Mansi national district near the lower areas of the Ob and Irtysh rivers in western Siberia in Russia. The climate they are from is severe with extreme cold, deep snow, and a lack of grain foods. Ob Ponies are used chiefly as pack animals in the winter. During the summer months they do not work and are left free to graze the marshes. Ob Ponies live long lived and fertile; they work until they are eighteen or twenty years old. In general they are similar Yakut Ponies, although they are more of draft type. They are hardy and enduring. They are small in stature with a long back and well developed skeleton. Their legs are short. Their head is of medium length, coarse and often Roman-nosed; their neck is short and thick; their shoulder is slanted and short; their withers low; their back is long and often carp-shaped; their legs are sturdy. Their hooves are wide and flat. And they usually stand between 13 and 14 hands high. They vary in color, but typically they are dun. 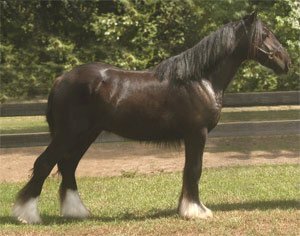 Also dun, grullo, and bay Ob ponies usually have dun factor markings - dorsal stripe, shoulder stripes, and zebra striping on the legs. The first research on this breed was done in 1936. Ob ponies are rare today.